Despite lower profits the corporate sector’s financial standing and financing conditions are good. But private domestic firms are still reluctant to expand investment. Ongoing political changes are destabilising the country’s legal framework, undermining trust in the rule of law. 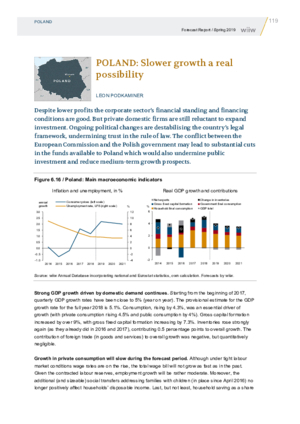 The conflict between the European Commission and the Polish government may lead to substantial cuts in the funds available to Poland which would also undermine public investment and reduce medium-term growth prospects.